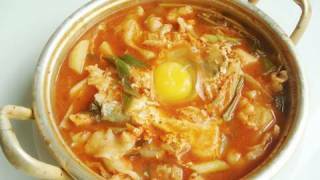 Sujebi is a traditional Korean noodle soup, and is well-loved and popular among Koreans. The noodles are made with homemade dough, and while noodles are usually cut with a knife, these noodles are unique in that each flat noodle is torn by hand! The ingredients are very simple and it doesn’t cost much money to make, so it used to be regular food for some poor people who couldn’t afford rice. But Koreans still love this food and eat it all the time. Once I read it, I wanted to make kimchi sujebi. Whenever I eat my kimchi sujebi, I think about the actress! What she said in the magazine motivated me to like sujebi more than before. My grandmother used to make sujebi in a huge iron pot. 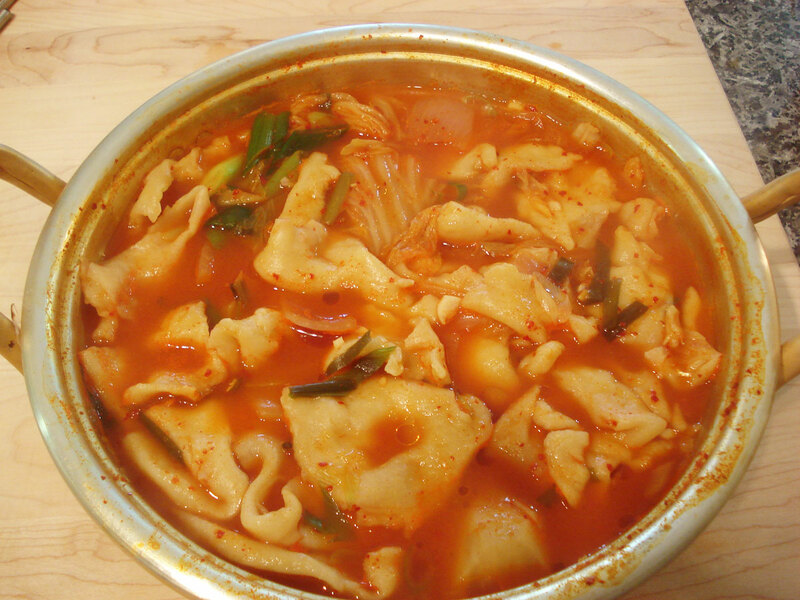 When she decided to make sujebi for lunch, she would start kneading the dough soon after breakfast. She put the dough into a basin, and brought it out of the kitchen. She sat down and was kneading and pressing, and talking to us at the same time. Koreans usually use a large bowl or basin to knead dough instead of a cutting board. I stood next to her and helped her tear the dough and put it into the boiling soup, but couldn’t follow her speed. My dough usually turned out too thick and when the soup was done, I could easily see who got my noodles. Oh, so many good memories about my grandmother! I should have learned more from her, if only I had known I would be blogging about Korean traditional food someday. She passed away long time ago, and her life was dedicated to feeding her husband and children. She was a real expert on cooking Korean food. Combine the flour, ¾ cup water, salt, and vegetable oil in a large bowl. Knead by hand for 10-15 minutes until the dough gets softer and sticks together firmly. Put the dough into a plastic bag and keep it in the refrigerator. *tip: Using a food processor is very convenient and saves time. If you use a food processor, use the dough blade and knead all the above ingredients for 1 minute until the dough sticks together and gets lumpy. Bring it to a boil for 20 minutes over medium high heat, then lower the heat to simmer for another 20 minutes. Turn the heat off and take the anchovies and kelp out. Add the potato, onion, and garlic to the pot and boil 10-15 minutes over medium high heat. Cut the cooked kelp into bite sized pieces. Set aside. Open the pot and add fish sauce, soup soy sauce (or salt), and the kelp strips. Now it’s time to make noodles! Put the dough in your left hand, and pull and stretch it with your right. Get it as thin as you can. Then tear it into bite sized pieces with your right. Drop it into the boiling soup. Repeat this until the dough runs out. *tip: If you make more than 4 servings’ worth, tearing the dough may take too long. So all family members should work together. Close the lid and cook for a couple of minutes to let the noodles cook. The noodles will float on the surface when cooked properly. Transfer to a bowl and serve hot with kimchi. Combine flour, ¾ cup of water, salt, and vegetable oil in a large bowl. Knead by hand for 10-15 minutes until the dough gets softer and sticks together firmly. *tip: Using a food processor is very convenient and saves time. If you use a food processor, use the dough blade and knead all the above ingredients for 1-2 minutes until the dough forms a ball. 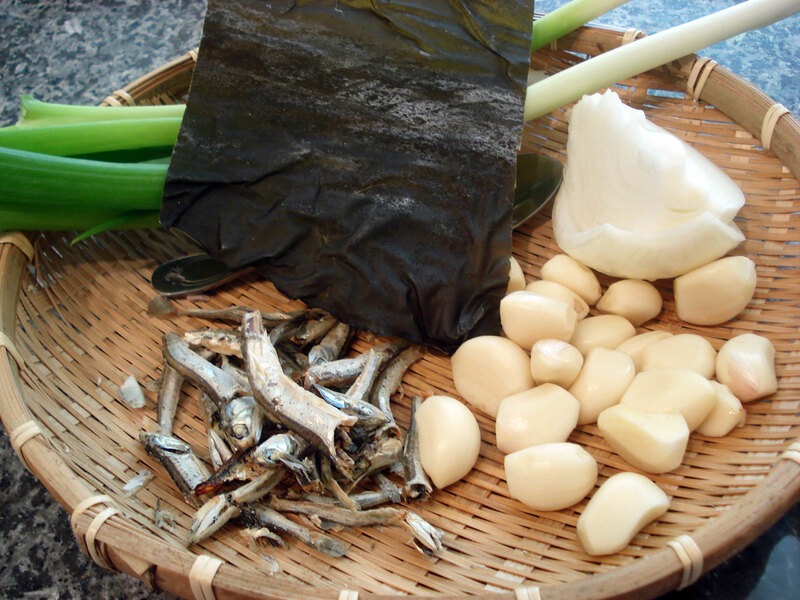 In a shallow pot, place 3½ cups of water, the kimchi, kimchi juice, potato, onion, garlic, and dried anchovies. Close the lid and bring to a boil for 10 minutes over medium high heat. Lower the heat and simmer another 10 minutes. Meanwhile, take out the dough from the refrigerator and knead a few more minutes until the dough gets smooth and silky. Put the dough back into the plastic bag. Open the lid of the boiling pot and take out the anchovies and add hot pepper paste. Stir it with a spoon. Divide the dough into 2 pieces. Put 1 piece of the dough into a plastic bag and keep it in the fridge for a future use. Put the other dough in your left hand, and pull and stretch it with your right. Get it as thin as you can. Then tear it into bite sized pieces with your right. Drop it into the boiling soup. Repeat this until the dough runs out. Turn the heat off and add green onion and a few drops of sesame oil. Posted on Friday, October 9th, 2009 at 4:58 pm. Last updated on April 26, 2015. Posted December 4th, 2017 at 2:57 am | Log in to reply. Made this today. Very new to Korean cooking. As I was preparing this soup I was concerned it was not right. When I finished, WOW, perfect. Thank you very much for your time and effort, Maangchi! Posted December 4th, 2017 at 2:50 am | Log in to reply. This was delicious! I am so excited to cook Korean! Pictures of all my adventures incoming! Posted August 19th, 2015 at 10:17 am | Log in to reply. Posted January 21st, 2015 at 10:26 pm | Log in to reply. Posted January 24th, 2015 at 9:31 am | Log in to reply. Thank you for sharing your story with me here. I’m sure your mom would be proud of you if she could taste your sujebi. “cooking korean food using your recipes reminds me of my mom and makes me feel closer to her!” I’d love to give you a big hug! Posted October 2nd, 2014 at 1:13 am | Log in to reply. Definitely going to have to make this once I take a trip to Paldo World! If you ever come visit the rainy state of Washington, keep me in mind! Posted May 16th, 2014 at 12:37 pm | Log in to reply. Thank you so much, Maangchi for the detailed instructions and thoroughness of this recipe! I was feeling awful recently and woke up craving some good sujebi, but not wanting to get out of bed. I turned over and whined to my boyfriend “I waaaannnt suuuujebiiiiiii,” so he looked up this recipe, ran it by me (I told him it looked good, but to add some sliced zucchini) then made it for me! I was shocked that he, as a Mexican American who has never cooked a Korean meal, was able to make sujebi better than most of the Korean restaurants around here with very minimal coaching. I know that if I had tried to explain to him how to make it, it would have ended in disaster, because I’m in the “small handful” or “until it smells right” school of cooking, and he likes exact amounts. The soup was great, and helped me to feel better. 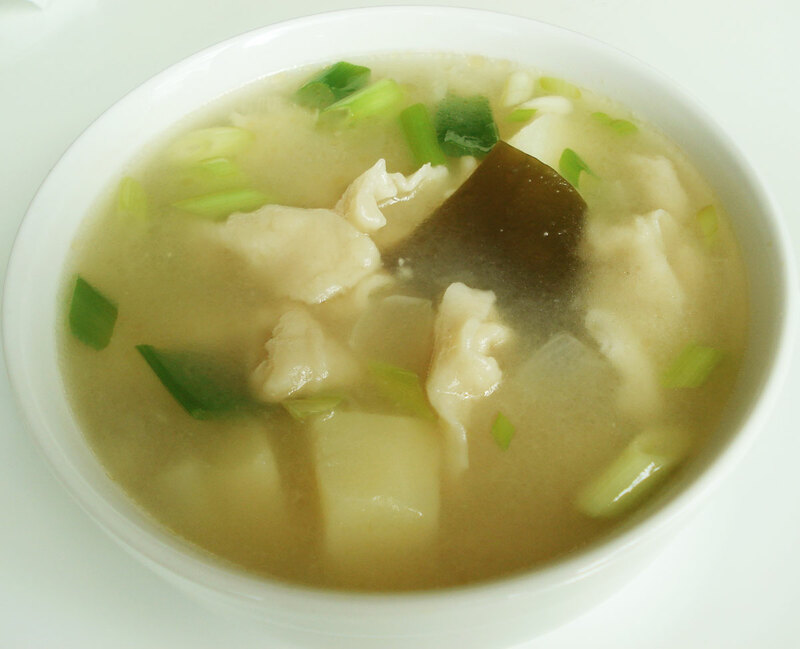 There’s really nothing like a nice hot bowl of sujebi to calm an angry stomach. So, thanks again! Now that I know he can use your recipes, he might just be cooking me Korean food more often! Posted March 30th, 2014 at 10:57 pm | Log in to reply. Posted November 11th, 2013 at 10:39 pm | Log in to reply. Hi Maangchi! I finally got myself to join your website and wanted to THANK YOU so much for being an inspiration & changing the lives of so many people! So, I just made my most favorite this ever and this recipe was better than I had at most restaurants so thank you so much! The only thing was that my dough (hand kneaded) was tough so I just added more oil? I definitely need more practice on this part! Posted November 13th, 2013 at 10:23 am | Log in to reply. “this recipe was better than I had at most restaurant” great compliment! I would add more water instead of oil. Posted June 14th, 2013 at 6:18 pm | Log in to reply. Okay , the very first time i made sujebi was 3 years ago !!! i can’t believe i only made this dish once !! Anyway i have to post another comment , because this time , i didn’t use store bought kimchi like 3 years ago . I used the kimchi that i made from your recipe :) The result was so much better and i added eggs and shrimps at the end of cooking . Everyone loved it , i doubled the recipe and we finished them all for dinner :) This will be a good dish for a cold rainy night , but yesterday was super hot and we still enjoyed the dish !! Posted June 17th, 2013 at 1:19 pm | Log in to reply. Posted April 7th, 2013 at 7:22 am | Log in to reply. I made this recipes today….. I made the spicy version with my kimchi. I don’t have hot pepper paste, but I substitute it with soy sauce, and it’s turn so yummy…. I’ll upload the photo soon…. Bye everyone…..
Posted February 16th, 2013 at 2:40 pm | Log in to reply. Can I make the dough, put some in the soup, and then put the unused dough in the fridge until the next day? I’m cooking for myself and I can’t eat all of it in one day! Will the dough get too hard? Thank you! Posted February 17th, 2013 at 11:18 am | Log in to reply. Keep the leftover dough in the refrigerator. It will be ok up to a few days. Posted February 19th, 2013 at 7:04 pm | Log in to reply. Thank you! I didn’t know you responded to me here, so I asked on facebook. You can disregard my question on there. 감사합니다! Posted February 6th, 2013 at 6:30 pm | Log in to reply. Hi! I’m having a what I think is a big problem… I’m not Korean in the least, nor have I ever made Korean food. I went to an Asian market and purchased all of the ingredients for this but.. when I was buying the ingredients I wasn’t sure if kelp and seaweed were the same thing so I looked it up on my phone and it said they were. Anyway, it doesn’t look like your picture and it’s not cooking like your directions. Straight when I put it in the pot it turned to mush and it’s definitly not something I would be able to cut into bite-sized pieces and it says right on the package “Dried Seaweed”. Do you have any idea what I’m cooking with and what I should buy next time? Posted February 7th, 2013 at 2:57 pm | Log in to reply. Some of my readers printed out the photos of the ingredients they’re looking for, take it to their Korean store and show it to the people there so they know they’re getting the right ingredient. Maybe you should try that. Posted August 4th, 2012 at 10:16 pm | Log in to reply. Posted August 5th, 2012 at 11:41 am | Log in to reply. It’s for 2 or 3 servings. Posted July 16th, 2012 at 6:06 am | Log in to reply. Can you please tell me the recipe and how many ingredients to put in for a family of 6. For example, how many ml of water and spoons of salt or soy sauce etc. Posted July 16th, 2012 at 8:57 pm | Log in to reply. This is for 3 servings, so triple the recipe. Posted May 10th, 2012 at 9:39 am | Log in to reply. Posted May 10th, 2012 at 6:09 pm | Log in to reply. awesome! While you are eating sujebi, you will miss your mom! Happy cooking! 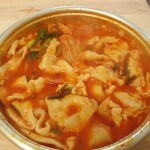 This recipe was originally posted on October 9, 2009 at 4:58 pm by Maangchi. It was last updated on April 26, 2015. The video was watched 709,523 times on YouTube & has 4,236 likes!